Patients with T2D have elevated blood glucose levels due to insulin resistance. Despite the fact that exercise is associated with inflammation, physical activity has beneficial effects on T2D, which highlights the ambivalent role of muscle inflammation in controlling glucose levels. To unravel the processes at work, the SMILED project has characterised the inflammatory responses in skeletal muscle to exercise and metabolic diseases. "Because inflammatory responses can significantly differ between rodents and humans, we proposed to work only on human material," explained project coordinator, Prof. Juleen Zierath. Activation of the immune system during exercise is beneficial and necessary for adaptation to exercise, whereas uncontrolled inflammation during obesity and T2D is deleterious. As such, this damaging inflammation contributes to the development of complications like cardiovascular diseases. Whether there is a link between local inflammation of muscle and T2D is still unknown and no therapeutic strategies target skeletal muscle for T2D treatment. "We believe that understanding these fundamental differences in immune activation can open new perspectives targeting skeletal muscle to prevent or treat metabolic diseases," stresses fellow Dr. Nicolas Pillon, lead researcher with the project. SMILED researchers characterised and compared muscle inflammation in humans during exercise and T2D. Both situations have their own chemical pathways and the scientists wanted to target molecular cascades that could improve insulin sensitivity. To achieve this, they developed strategies to emulate diabetes and exercise in vitro. Inflammatory responses were then modulated to improve insulin sensitivity or alleviate insulin resistance. Exercise, like any environmental change, has a lasting effect on muscle and this is reflected in epigenetic changes. 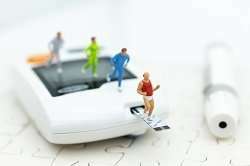 The team compared and recorded modifications to the epigenetic exercise memory with that of diabetes to determine the effects on inflammation and resistance. All the data generated and collected by the SMILED researchers, as well as by other investigators from their published studies, has been compiled into the most complete database yet. This "meta-analysis" of all exercise studies, MetaMEx has enabled a powerful analysis of the adaptive response of muscle in different populations. The young/elderly and male/female are categorised into different health status such as T2D and chronic kidney disease. The user-friendly interface provides the possibility of searching for a single gene to get a complete overview of its behaviour across all exercise studies. Regimes include acute aerobic exercise, training resistance exercise down to physical inactivity. "Using MetaMEx and data from our own clinical studies, we have identified a different response to exercise in metabolically impaired individuals (obese/type 2 diabetic) compared to healthy volunteers," stresses Dr. Pillon. This is of particular importance to understand how to potentiate the metabolic benefits of exercise and opens exciting new avenues of research. SMILED has built a substantial knowledge platform for future studies on the impact of different exercise regimes on muscle metabolism and on T2D. "We have identified several genes that are selectively deregulated in skeletal muscle of obese or type 2 diabetic individuals and we are in the process of characterising their metabolic effects and therapeutic potential," states Dr. Pillon. As a start, SMILED research results are under review in a paper 'Transcriptomic Meta-Analysis of Skeletal Muscle Responses to Physical Inactivity and Exercise'. In the long run, Prof. Zierath predicts that "links between exercise and inflammation can be translated into anti-inflammatory intervention strategies to improve insulin sensitivity and treatment of metabolic diseases in the personalised medicine arena."